These are just some of the words that we will chant at the LA Pride #ResistMarch this Sunday, June 11. They embody how we feel: prideful, progressive, powerful, and loving. They also encourage us to believe that change and direct action start with young people like us. Resisting at Pride is not new for many young people or LGBTQ+ people of color who have felt the effects of prejudice based on their race and are often overlooked and even excluded as these parades and festivals became mainstream and commercialized to cater to privileged or affluent members of the LGBTQ+ community. Resisting at Pride now demonstrates that we will not let young people be oppressed. We will show that we have a voice and will not be shut down. We won’t be stopped by anyone. As President Trump surrounds himself with vocal opponents of LGBTQ+ rights, like Mike Pence, Jeff Sessions, and Tom Price, it is apparent that our nation is taking a step back in the fight for equality. #ResistMarch is integral to the movement, allowing us to raise our voice and be seen. And it allows us to unite and show our resistance to bigoted views and legislation. Until we can safely and unapologetically parade who we are, we will continue to resist the hate and oppression that has begun to resurface in cities across the country. 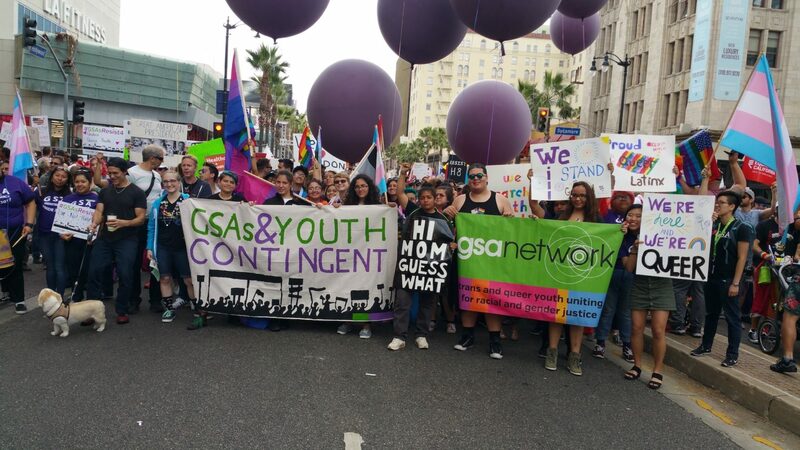 When we unite as LGBTQ+ youth and resist in solidarity, we are challenging injustice together and showing people that our organized resistance is a force to be reckoned with. We won’t be stopped until our fight is over. Charlie is a Pansexual Trans-man, a recent graduate of West Valley High School, and has been a youth leader with GSA Network for 2+ years. Natalie is a Cisgender Lesbian, a recent graduate from Gabrielino High School, and has worked with GSA Network’s Queerdom Youth Council for 2 years. Stephanie is a Queer Latinx, a senior at Manual Arts High School and lives in South Central LA. Stephanie has worked with GSA Network for nearly 2 years and is a member of the Queerdom Youth Council. MTV News correspondent Meredith Graves speaks with GSA Network youth at the LA #ResistMarch.